Steve (black shirt and cap) leads the tour. We hosted Korean visitors this week. It was an animated group of farmers, scientists and extension agents interested in organic agriculture. They asked many questions and wanted to touch everything. They were particularly interested in irrigation, cover crops, and the CSA. Their translator struggled to explain the CSA concept but they seemed to understand. We packed the CSA boxes with an attentive audience. Visitors examine a roll of plastic mulch on the mulch layer. Steve showed them a field of pepper seedlings planted into rows covered with plastic mulch, similar to the onions in this post. Then he showed them the equipment he used to install the thin sheets of plastic, above. The translator could barely keep up with the questions and discussion. Coopers Tavern dinner – Thanks to everyone who came to the Partner Shares benefit dinner at the Coopers Tavern. We enjoyed an excellent meal with current Tipi members, former Tipi members, former employees, food activists and old friends. My favorite dish was the pickled spring vegetable salad, a mix of individually pickled asparagus, radishes, bok choy stems and morel mushrooms. The asparagus was pickled in a fennel-scented brine, very yummy. The beer was donated by Peter Gentry of One Barrel Brewing Company. 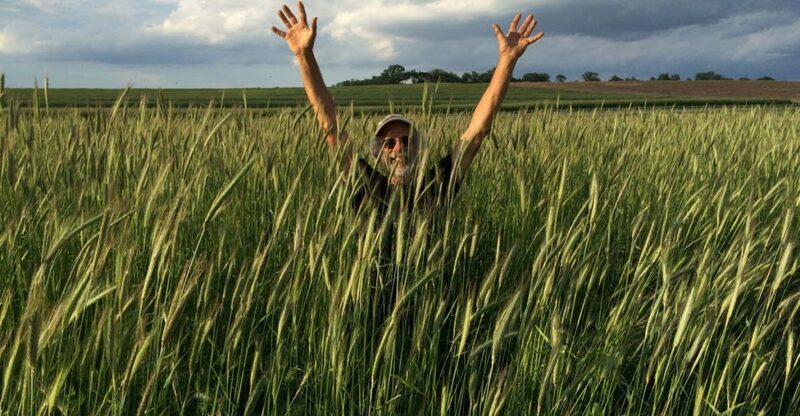 Peter was a member of our farm for many years, so it was fun to re-connect over our food and his beer. This Week’s Box – I’ll list the box contents here (as well as in the sidebar) so it appears in the RSS feed and when printed. Weekly members and PURPLE every-other-week members get a box this week. 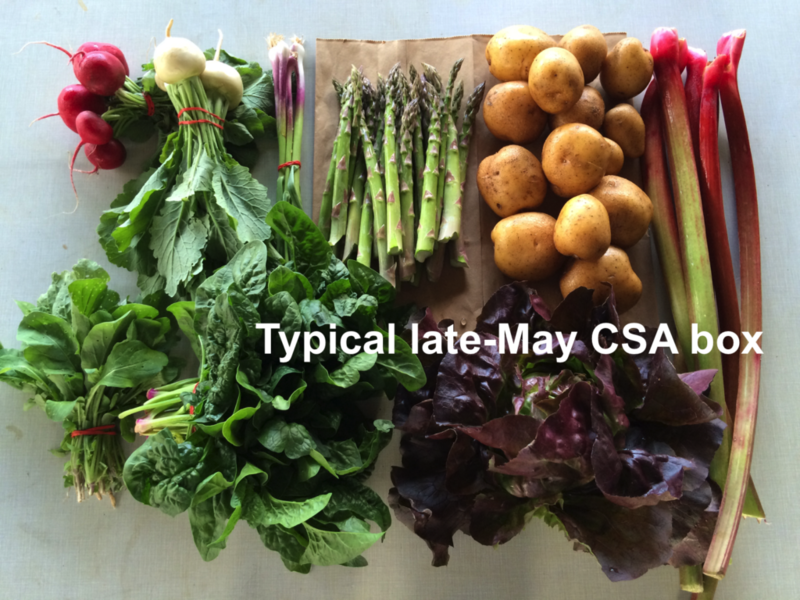 Next week’s box will probably contain asparagus, white salad turnips, lettuce, scallions and more. – The plants started to bolt so we harvested them a bit younger than usual. You can eat the entire plant – cook the central stem with the leaf stems. Each spring, we face the decision of whether to cover the bok choy seedlings with row cover or not. They tend to bolt (flower prematurely) when under row cover, but get damaged by flea beetles if left unprotected. We tried both methods this spring. Wow, the uncovered ones were devoured by beetles. I’m glad we had these under cover. Cilantro (bundle of fragrant green leaves) – This herb is good in salsa, chutneys and salad dressings, or added to stir-fries. Used in Mexican, Asian and Indian cooking. We are delighted to send cilantro in combination with bok choy and scallions because they are so tasty together. Rhubarb – This is our last rhubarb delivery for a few weeks. We’ll send more once the strawberries are ready. Remember, rhubarb is easy to chop and freeze. We add frozen rhubarb to cakes, muffins, or pies. Rhubarb pancakes are excellent with sweetened yogurt.